This District has a mixture of land uses including retail, entertainment, business and residential. The District also runs alongside the River Clyde and has significant transport hubs, St Enoch’s Subway and Argyle Street train station. One of the most dominant building is the St Enoch Shopping Centre, but this does not take away from historic richness found in many buildings in and around the High Street, Trongate and the Saltmarket. There is an opportunity to promote this mixture of function and use by creating an improved pedestrian environment in certain public spaces. The waterfront experience should make the most of all the things that are happening in the District while promoting itself as a place to go at the same time. The following suggested Avenues projects for this District will significantly improve the look and feel of these public spaces. 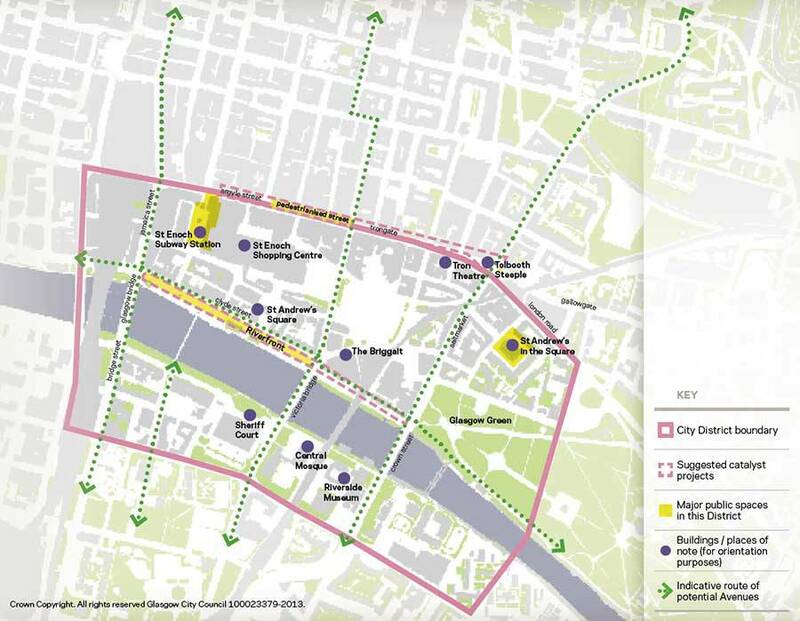 The following possible projects for this area would complement the Avenues by significantly improving the pedestrian and cycling experience as well wayfinding. Find out the latest news about St Enoch here.